Hmm... 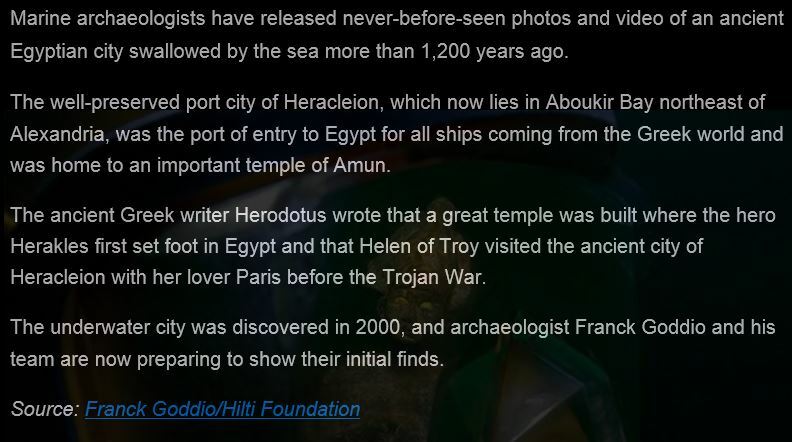 So maybe lost city of Atlantis isn't just a myth. I know, isn't it incredible that you can find things like this, a look into the past. Makes you wonder what else lies beneath? Saw some youtubes about the old port of Heracleion, a long time ago. Picachu wrote: Makes you wonder what else lies beneath? How could anyone be BORED!!! of our lovely Georgie?????? Theminis, are you sure you're in the right place?? Now if it was Georgie in an off-the-shoulder toga, then you're talking!!! fluffy wrote: How could anyone be BORED!!! of our lovely Georgie?????? Theminis, are you sure you're in the right place?? Now if it was Georgie in an off-the-shoulder toga, then you're talking!!! Anyway Theminis thanks for this it really is amazing that the currents haven't eroded the different types of stone. We do not think about it much today, but back then they were pretty expert at building this kind of things. They did not have our technology but had to be very adapt at mathematics to be able to calculate stress from weight and everything else that's need for things to last. Beautiful. Being married young I didn't graduate high school and even though I taught myself and got my GED I always felt that I missed so much on cultural learning. I earned more than half the credits for an accounting degree when my husband got sick. After he passed I never was able to go back. Since I have taken many course but not towards a degree. I feel that I need to learn something everyday just because I enjoy learning. That area was very popular and even several Roman emperors visited it because Alexander the Great supposedly was buried there (his mausoleum moved twice due to robberies) but starting in 360 AD a series of events like warfare, riots, earthquake (a very powerful one) and a tsunami destroyed most of that area which sank in the sea. Everything was lost and despite centuries of relentless searching by archeologists, authors and amateurs it has remained so. With this new finding...maybe there is hope that one day the may find Alexander's tomb too. Im glad that you all enjoyed this thread, I love archaeology, especially learning about the civilisations that came before us, how they lived, Egypt in particular. Socimar - yes finding Alexanders tomb (if hopefully not destroyed) would be another amazing find. thanks so much theminis , as i am egyptian happy you love our history ! lolo"layla" wrote: thanks so much theminis , as i am egyptian happy you love our history ! I love it, I have lots of books, some little collections, I google earth the pyramids and sphinx all the time, just incredibly fascinating.